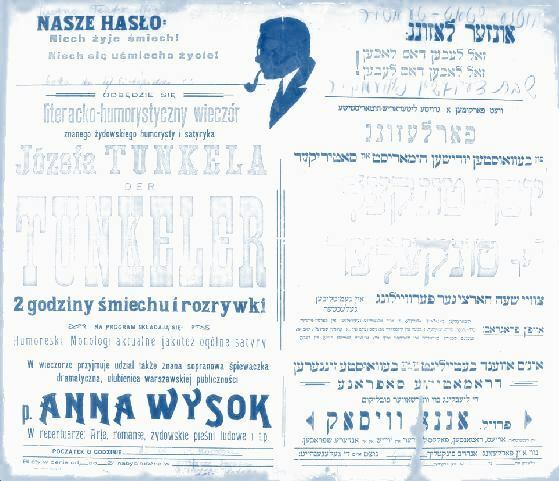 Joseph Tunkel (1881–1949), better known by his pseudonym Der Tunkeler (The Dark One), was one of the most prolific Yiddish humorists—he authored more than thirty books and some fifteen hundred pieces in the Yiddish press. Of his vast, diverse oeuvre, the most unique and powerful of his pieces are those that capture a particular, now nearly forgotten moment in Jewish cultural history: the moment when Eastern European Jews were entering modernity and becoming conscious of their own status as a people straddling the border between an extensive, ancient, multilingual literary tradition and a rapidly vanishing, orally-transmitted vernacular language and folk culture. 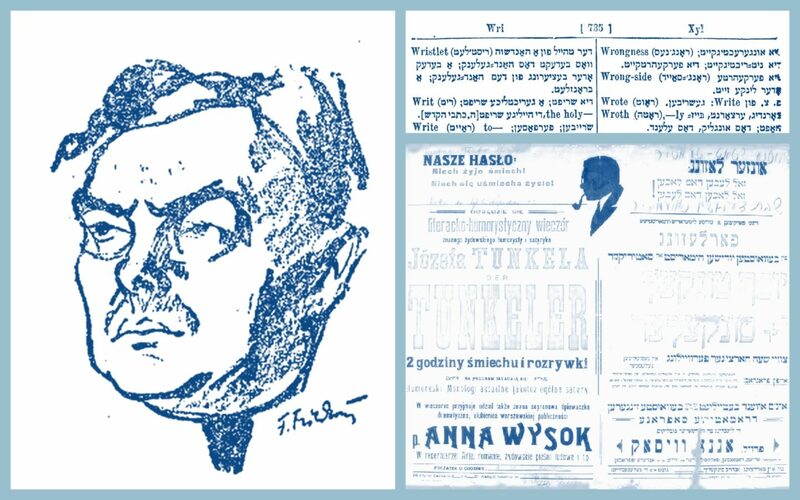 Der Tunkeler wrote several pieces exploring this theme, in particular poking fun at the self-styled bombastic “erudition” of members of modern Yiddish academic circles, which at the time he was writing had existed for little more than a generation. His monologue “Yiddishists” is the tour-de-force of this genre. Told from the point of view of a member of the older generation, the piece’s humor is geared toward the sensibilities of the younger generation—even when the joke’s on them. A father complains about his children, who, once Russified, have now developed a new enthusiasm for Yiddish and traditional Jewish religion and culture. They fancy themselves ethnographers, and thus he, their father, finds himself in a new role: their number-one informant. Apart from the historical value of this snapshot in time, and the genius of the plot device and linguistic play upon which it relies, the monologue is newly poignant today, in an era when many of us can identify with the younger generation’s desire to engage in a project of cultural and linguistic “salvage”—a project that, as the monologue makes abundantly clear, is always already doomed from the outset. For those of us unfamiliar with this chapter of late nineteenth-century Jewish history, it can be startling to realize how early the project of self-conscious Eastern European Jewish autoethnography began: multiple generations before the Holocaust definitively rendered it both desperately urgent and hopeless. 1 1 For more information on the emergence of Yiddish autoethnography, see Barbara Kirshenblatt-Gimblett’s article in the YIVO Encyclopedia: “Folklore, Ethnography, and Anthropology” (2010), http://yivoencyclopedia.org/article.aspx/Folklore_… (accessed December 11, 2018). 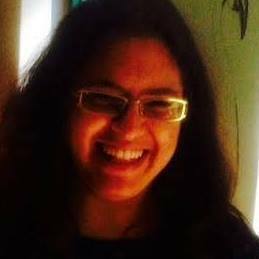 The monologue’s humor is highly linguistic and context-bound, and thus not always easy to reproduce in English. The most important thing to know in order to “get” the jokes is that what the speaker considers “ordinary Yiddish” is in large part pure Russian, whereas Yiddish words that are quite common from the point of view of a reader of literary Yiddish (i.e. Der Tunkeler’s intended audience) seem to the speaker like laughable neologisms. To be fair, the “autoethnographic generation” did also coin quite a few jargony neologisms, which the speaker also lambasts ruthlessly. I did my best to translate most of the jokes fully into English, but in cases where an extra bit of context is needed, you’ll find a footnote to that effect. This piece is an early fruit of a project to produce a book-length collection of Joseph Tunkel’s humoresques in English translation. I would like to thank the National Endowment for the Arts Translation Fellowship and the Yiddish Book Center Translation Fellowship for their generous financial support of this project, and the Paris Yiddish Center-Medem Bibliothèque for providing me with the best possible setting in which to carry out the work. Heartfelt thanks are due to my mentors Ken Frieden, Natalia Krynicka, Yitskhok Niborski, and Sheva Zucker for their guidance on this translation. Thanks also to Alyssa Gillespie and Asia Fruman for their assistance with Russian transliteration. Extra special thanks to Sheva Zucker for introducing me to this text, and to Der Tunkeler bikhlal, at the Uriel Weinreich Summer Program at YIVO in 2013. That’s where this project was born—and “Yidishistn” is still one of my favorite Yiddish texts of all time. װי גייט עס מיט מײַן סעמייסטוואָ? נישט צו פֿאַרזינדיקן, עס דרודלט זיך... הײַנט גייט בײַ אונדז אַ נײַע סדרה – ייִדישיזם. וואָס איז דאָס פֿאַר אַ נײַע נאמנה אַזאַ? – ווייס איך נישט. זאָגן, זאָגט מען, אַז דאָס איז כּמעט דאָס זעלבע, וואָס ייִדישקייט, נאָך מער פֿון ייִדישקייט, ייִדישקייט מיט אַ שמיציק... און מען פֿאַרטײַטשט עס מיר מיט כּלערליי משונה־מאָדנע ווערטער, הלוואַי זאָל עס זײַן צו גוטן. אַ מאָל, אַ שטייגער, פֿלעגן קומען צו מײַנע קינדער געסט, חבֿרים. פֿלעג איך שוין און מײַן אַלטע מוזן ברעכן די ציין און רעדן רוסיש. נישט איין מאָל פֿלעגט מײַן אַלטע זיך וועלן אויסדרייען און שיקן מיך: גיי שוין, גיי, וועלוול, די געסט זענען געקומען און מען דאַרף מיט זיי רעדן רוסיש, און איך האָב אַזוי קיין צײַט נישט און קיין כּוח נישט... פֿלעג איך שוין גיין. פֿאָרט אַ מאַנצביל, מער קוראַזש. "זדראַסטי, זדראַסטי!"... הײַנט פּרוּווט זיך אויסרעדן "זדראַסטי," וועט מען אײַך דורס זײַן. און בײַ מיר – אַ רגילות, אַ לעבן, אַז מען מושטירט מיך. כאַפּט זיך אַ מאָל אַרויס מיט יונגוואַרג אַ "זדראַסטי!" איז הימל עפֿן זיך, פּונקט ווי איך וואָלט באַגיין, ווער ווייס וואָס פֿאַר אַ קרימינאַל. "ייִדיש, ייִדיש, זאָל מען רעדן!" – גוטע יאָרן, אַז מען הייסט טאַטע־מאַמע רעדן ייִדיש. 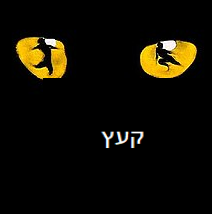 מילא, ייִדיש, איז ייִדיש. נאָר וואָס איז דאָס אָבער פּלוצלונג געוואָרן אַזאַ בהלה מיטן ייִדיש, פֿאַרשטיי איך ניט. מיט דער שטוב־שיקסע רעדט מען שוין ייִדיש; מיט דער קאַץ, מיט דעם הונט, מיט דער בהמה… כ'מיין, אפֿשר זענען זיי גערעכט... פֿון וואַנען איז טאַקע געדרונגען, אַז מיט אַ בהמה און מיט אַ קאַץ דאַרף מען רעדן רוסיש? אָבער וואָס פֿאַרלאַנגען זיי – אַז עס קומט לפּידות דער רופֿא אָדער קלמנזאָן דער פּאָדריאַדטשיק, זאָל איך מיט זיי אויך רעדן ייִדיש. אַ שיין פּנים וואָלט עס האָבן, ווי מיינט איר? Yiddishists: A Monologue by a Jew from Kiev 2 2 This monologue was previously translated by Max Rosenfeld under the title “Yiddishists: A Kiev Monologue” (Moment 6, no. 5, May 1981, pp. 54-58). However, the monologue was erroneously attributed to Yiddish writer Zalmen Wendroff, following the attribution of the Yiddish text to Wendroff in the eighty-first volume of the Musterverk series of Yiddish classics (Der emes durkh gelekhter in der yidisher literatur, Shmuel Rozhanski, ed. (Buenos Aires: YIVO, 1980), 66-81). The origin of this earlier misattribution is difficult to ascertain. Rozhanski asserts that the monologue was written in Warsaw in 1911, but does not name the source in which it was first printed. The monologue certainly appeared in the Warsaw daily newspaper Der moment in 1918 under Der Tunkeler’s name (and was subsequently reprinted in his collections Der regnboygn: A zamlung shriftn (Warsaw: Tsentral, 1922?, 59-73) and Oyf tsu kloymersht: Humoreskes (Warsaw: Tsentral, 1924, 53-67). It is almost certain that the monologue was written later than 1911, considering its allusion to Noyekh Prilutski’s collection of toponymic epithets, the first half of which was not published until 1912 (see note 14 below). It is also likely that despite his attribution note, Rozhanski took the text of the monologue from the book Oyf tsu kloymersht, because there is a flaw in the printing of that edition that Rozhanski reproduces in his text (the word translated below as “sequence” which appears in the Moment and Regnboygn printings as “parondek” appears in Oyf tsu kloymersht as “parodnik” with a mostly obscured peh, leading Rozhanski to read, print, and annotate it as the far-fetched “ordenik”). Finally, further evidence that the monologue was indeed written by Der Tunkeler can be found in his humoresque “Vi di provints redt” in the collection Mit di fis aroyf (Warsaw: Ahisefer, 192? ), where he elaborates further on the likelihood of confusing the similar-sounding words oysvorf, forvorf, and oyfruf (translated below as “cast out,” “castigate,” and “agitate”). How’s my family, you ask? Can’t complain, never a dull moment. These days we’re in the throes of a new fad: Yiddishism. What kind of new religion is that, you ask? I myself don’t know. They say it’s basically the same as Judaism, only more so—Judaism with a smidgeon extra. And when they try to define it for me, they use all sorts of outlandish words. I can’t make any sense of it, so I just hope for the best. They’ve gotten so Jewish that now I’m the goy. I used to scold my children, “Be Jews!” Now they scold me, “Dad, be a Jew!” My older son used to be Zinovy Vladimirovich, my younger son—Gerasim Vladimirovich, and my daughter, the student—Claudia Vladimirovna. That makes me, needless to say, the Vladimir. How d’you like that, “Vladimir”? There’s no denying it, when I take off my hat and I’m left wearing only my yarmulke, I look like a regular Christian … Anyway, just try calling my son Zinovy today—he’ll scratch your eyes out! Zalmen’s his name, says he. And not only Zalmen, but Zalmen-Todres—he’s remembered that his grandmother, may she rest in peace, once told him that he had a middle name Todres, after his great-grandfather. And my Gerasim says to call him Groynem. He likes the name Groynem. A name like that would once have made him a laughingstock, but today it’s considered classy. It has, according to them, a certain ring. It sounds—what’s that word they use? Folkloristicalistic. The devil knows what that means! What are we coming to? Young people telling their parents to speak Yiddish! Nu, if they want Yiddish, we’ll speak Yiddish—but what’s the big deal with Yiddish all of a sudden? It’s gotten to the point where they’ll speak Yiddish to the Gentile maid, the cat, the dog, the cow … I mean, maybe they’re right. Who says you have to speak Russian to a cow or a cat? But that’s not all—with Lapidus the medic and Kalmenson the contractor they want me to speak Yiddish! 3 3 It is clear from their surnames that Lapidus and Kalmenson are Jews. This joke is a commentary on the degree of Russification of Jews working in professions which require some amount of formal education and/or integration into the surrounding society, and the higher social status with which that Russification is associated. These particular professions attracted maskilim, proponents of the Jewish Enlightenment, who viewed the Yiddish language with contempt and advocated that Jews integrate into the surrounding society. Now what kind of impression do you think that’ll make? וואָלט עס געווען כאָטש אַ ייִדיש רעדן! פֿאַרשטיי איך זייער ייִדיש נישט מער פֿון דאָס גאַנצע ייִדישקייט זייערס, אַז "געטראָפֿן אַ סלוטשײַ" איז בײַ זיי "געשען אַ געשעעניש," אַז אַזאַ פּשוט וואָרט, ווי "ניעפּריאַטנאָסט," איז בײַ זיי אומאָנגענעמלעכקייטישקייטן... איר קענט עס אַרויסרעדן? אַנו, זײַט אַ בריה און טרעפֿט, וואָס איז דער טײַטש: "אָנגעווענדט די אויפֿמערקזאַמקייט," "געמאַכט אַ באַמערקונג" און "געענדיקט"? טענה איך צו זיי: אַמער רעדט ייִדיש: "אָבראַשצאַעט וונימאַניע," "געמאַכט אַ זאַמיעטשאַניע" און "געקאָנטשעט" – וועט מען פֿאַרשטיין וואָס איר רעדט! אַ פּנים האָט עס געהאַט, ווען מײַן טאָכטער פֿלעגט, נישט הײַנט געדאַכט, רעדן מיט מײַן אַלטער רוסיש, און אַ פּנים האָט עס בײַ מיר הײַנט, ווען זי רעדט מיט איר ייִדיש, מײַן טאָכטערס ייִדיש: שטימונג, און לאַנגווײַליקייט, און סאַנטימענטאַליטעטלאָזיקייט... פֿון וואַנען קען איך דאָס אָט די ווערטער? – אָט, מען הערט זיך אָן, אײַנגעשטודירט. פֿאָרט בין איך דאָס עפּעס אַ מאַנצביל. נאָר מײַן אַלטע, נעבעך, מוטשעט זיך נאָך הײַנט מיט דעם ייִדיש, ווי אַ מאָל, נישט הײַנט געדאַכט, מיט דעם רוסיש. אַ ייִדענע, פֿאַרבײַט זי די יוצרות. וואָרעם, באמת, גיי זײַ אַ בריה און טרעף, ווען מען דאַרף זאָגן "אויסוווּרף," ווען "פֿאָרוווּרף" און ווען "אויפֿרוף"!? מײַן זינאָוויע, מײַן זלמן־טודרוס מיין איך, זעצט זיך אַוועק איבערן צאינה־וראינה, ווי אַ פּראָפֿעסאָר אין פּאָנסנע, אָן אַ היטל און לערנט מיט גרויס התמדה. קנייטשט דעם שטערן, דרייט מיטן גראָבן פֿינגער און פֿאַרגייט זיך פֿון גרויס טיפֿקייט און מתיקות... מײַן געראַסים, גרונם מיין איך, שרײַבט פֿון דאָרטן אויס גאַנצע שטיקער צו זיך אין ביכעלע אַרײַן, מיט הערות, מיט הגהות און פּירושים, און מײַן טאָכטער קלאַוודיאַ, קיילע מיין איך, דרוקט עס אָפּ אויף אַ שרײַבמאַשין. Now, if it were regular Yiddish, that would be one thing. But I understand their Yiddish about as well as I understand their Judaism. For example, instead of saying “a sluchai took place,” they’ll say “a happening happened,” and a simple word like “nepriiatnost’” turns into unpleasantnessishness. How about you, can you pronounce that? A pretty sight it was when my daughter used to speak Russian to her mother—and it’s even worse when she speaks Yiddish to her now. Here are some samples of my daughter’s Yiddish: “ambiance,” “tediousness,” and “sentimentalitylessness” … How did I come to know words like those? Well, I heard them from time to time, I picked them up after a while. I am a grown man, after all—it’s not too much of a challenge. But my wife, poor thing, wears herself out over this new Yiddish the same way she used to wear herself out with that blasted Russian. Women always get mixed up, it’s true, but really, who can be expected to keep track of the difference between “cast out,” “castigate,” and “agitate”? And what sort of Judaism do they practice? They study the Tsene-Rene 4 4 A compendium of Biblical stories, legends, and homilies primarily thought of as being intended for women; one of the bestselling Yiddish books of all time. The oldest still-extant edition (which was the fourth edition at least) was printed in 1622; new editions and versions continue to be published today. and other tekhines 5 5 Yiddish liturgy written primarily for women, associated with the daily, weekly, and monthly cycles of prayer and household customs, the yearly cycle of Torah readings and holidays, various lifecycle events, and other concerns having to do with family and home. of that ilk … My Zinovy, I mean my Zalmen-Todres, sits over the Tsene-Rene bareheaded, wearing pince-nez like a professor, and studies with great diligence. He wrinkles his brow, gestures with his thumb like a Talmud scholar, and goes into deep, sweet ecstasies … My Gerasim, I mean my Groynem, copies down entire passages in his little notebook, with annotations, marginalia, and interpretations, and my daughter Claudia, I mean Keyle, types it all up on a typewriter. און איך האָב גאָר נישט געוווּסט, אַז דאָרט געפֿינט זיך אַזעלכע גאונות. איר האָט געמעגט אַ מאָל זיך צוהערן, ווי אַזוי מײַן זלמן־טודרוס לייענט דעם צאינה־וראינה הויך אויפֿן קול פֿאַר אַן עולם פֿון זײַנע געסט. ווי אַזוי אַלע האַלטן דאָס אָנגעשטעלט מויל און אויערן און זענען מכוון יעדער וואָרט: "און האָט גאָט געזאָגט צו נח, דאָס איך וועל טאָן פֿאַרטיליקן אַלע באַשעפֿענישן און ווידמענונגען, וואָס טוען טאָן ווידמענען אויף דער ערד, נײַערט דו דאָס דער געפֿינען האָט חן־זעליקייט"... ווערט אַ שׂימחה אויף אַלעמען: "פֿאַרטיליקן!" אָוואַ! "טוען טאָן פֿאַרטיליקן!" ס'אַ טײַער וואָרט! ס'אַ גאָלדן וואָרט! "ווידמענונגען!" און "נײַערט!" הײַנט "זעליקייט"... הכּלל, מען צעגייט פֿאַר התפּעלות. און וואָס נאָך? די צאַצקעס פֿון צאינה־וראינה פֿאַרנעמט בײַ זיי אַן אויג. קלײַבן זיך אַרום נעבן יעדער צאַצקע פֿון טײַטש־חומש באַיאָרנטע מענטשן, סטודענטן, מאָלער פֿון קאַדעמיע און מען לעקט די פֿינגער. וווּנדער איבער וווּנדער! איך כאַפּ אויך אַ קוק. אַ צאַצקע. "דאָס איז די מעשׂה, ווי אָדם און חווה זענען אַרויסגעטריבן פֿון גן־עדן." "דאָ בויט נח די תּבֿה פֿון פּימסנהאָלץ." "דאָס איז, ווי רבֿקה גיט צו טרינקען די קעמלען פֿון אליעזר, דער קנעכט פֿון אַבֿרהם." וואָס זאָל זײַן? אָפּגעמאַלעוועטע קאַרטינעס. וואָלט עס כאָטש זײַן געמאָלט מיטן האַנט, איז עס געדרוקט מיט אַ מאַשין. זיי אָבער געפֿינען דאָרט מאָדנע חידושים: "שטיל" און "קונץ" און "שטריך" און "כאַראַקטערס" און "היסטאָריע" און ווי רופֿן זיי עס, פֿאָלקטילימליכקייט. זאָגט מיר, איך בעט אײַך, ווייסט איר נישט, וואָס דאָס איז אַזוינס? Are you getting the picture? My Zalmen-Todres is thirty-eight years old. He’s studied up on every branch of knowledge; he’s been to the four corners of the world—Leipzig, Paris, and France; he’s read every book and every philosophy; he’s exhausted all the libraries with all their collections of proclamations, their Tolstoys and Darwins and Gorkys and Edisons. There’s nothing he doesn’t know. If you want, he’ll explain to you how a gramophone works; if you want, he’ll explain why there’s a revolution in China. And if there’s no revolution in China, then he’ll explain that too. If you want, he’ll create a rainbow on a sunny day. Not in the sky, God forbid, but right down here on earth, with a jug of water and a spray-bottle … If you want, he’ll explain to you how money works. Not how to earn it, of course. Needless to say, that headache still belongs to me. Rather, money itself—the reasons why those who have it become wealthy men and those who don’t become raggedy paupers; and why a tailor tailors clothes and why a shoemaker makes shoes. In general, if there’s anything you want to know—all you have to do is ask him. And now he’s determined that the most important subject of all is Yiddish—and not only Yiddish, but Yiddish with grammar, 6 6 For someone like the narrator, whose (probably minimal) education would have taken place within a culture of study in which grammatical analysis even of written Hebrew texts (the Bible, for example) was considered at best newfangled and at worst heretical, an analytical approach to his highly non-standardized vernacular would have seemed the heights of absurdity. no less—and of all the wisdom in the world, the greatest pearls are to be found in the Tsene-Rene. This whole time, I never knew it was full of such genius … . You should hear how my Zalmen-Todres declaims the Tsene-Rene for his guests. Just take a look at them, with their ears perked up and their mouths gaping, ready to cherish the sanctity of each and every word: “And God said to Noah, ‘I shall put to ruination every beast and teeming thing which doth teem upon the earth. Forsooth, as for them upon whom I shall shine mine countenance … .’” And suddenly everyone becomes ecstatic: “Ooooh, ‘ruination’! Ahhhh, ‘put to ruination,’ what a splendid turn of phrase! What a word, ‘teem’! And ‘forsooth”! Let alone ‘shine mine countenance upon’!” … In short, their enthusiasm knows no bounds. And what else? Their eyes grow big at the sight of the Tsene-Rene’s other gems: its illustrations. Students, elderly men, painters from the ’cademy gather ’round and feast their eyes on every treasure. What marvels! I poke my nose in too. A caption: “The expulsion of Adam and Eve from the Garden of Eden.” Another caption: “Noah builds an ark of gopher wood.” And a third: “Rebecca waters the camels belonging to Eliezer, Abraham’s servant.” A few little pictures, big deal! It would be one thing if they were hand-painted, but these are machine-printed. But for this crew it’s somehow a novelty. “Style,” and “artistry,” and “feature,” and “character,” and “history,” and whatchamacallit, “folkloristicalicity.” Do me a big favor and tell me, do you have any idea what that means? צי טוען זיי עפּעס, מײַנע קינדער, געשעפֿט? איך ווייס? עפּעס האַוועט מען, עפּעס גייט בײַ אונדז אין שטוב אַ מיסחר, נאָר איך ווייס נישט מיט וואָס. האָלץ – נישט האָלץ, וואַלד – נישט וואַלד, תּבֿואה – נישט תּבֿואה, נאָר עפּעס אַ משונה־מאָדנע סחורה. וועדליק איך הער חזרנדיק דעם נאָמען, הייסט עס פֿאָלקלאָר. האָט איר געהערט אַ מאָל פֿון אַזאַ סחורה? דערווײַל איז בײַ מיר אין שטוב אַ פּאָלנע קאַנטאָר, אַ קאַנטאָר פֿון פֿאָלקלאָר. מײַן זון איז דער גלאַוונער דירעקטאָר. "טאָרגאָווי דאָם זלמן־טודרוס עט קאָמפּאַניע"... ביכער מיט שרײַבגעצײַג, מיט קאָרעספּאָנדענציעס, מיט קאַנצעלאַריעס. משולחים פֿאָרן אַרום בכל־תּפֿוצות־ישׂראל, מיט טשעמאָדאַנען, מיט פּאָרטפֿעלן. ווער עס אַרבעט אויף געהאַלט, ווער אויף פּראָצענטן. און טעלעגראַמעס גייען, קאָרעספּאָנדענציעס, געדרוקטע קאָנווערטן, פֿירמעס... און עס ווערט אײַנגעהאַנדלט סחורה: אַלטפֿרענקישע מטלטלים, חפֿצים פֿון מלך סאָבעצקעס יאָרן, שיבֿרי־כּלים, לידלעך. אַ מעשׂה מיט אַ רבֿ און אַ רביצין, ווערטלעך, משלים, רעטענישן... איך קאַוויר אײַך, אַז ווען עס מאַכט זיך אײַך אַ קאַזיאָנער פּאָדריאַד פֿון אינטענדאַנטסטוואָ, וווּ איר קענט כאַפּן אַ ריש אַלפֿים רובל (און איר זענט דאָך אַ ייִד אַ ניצרך, וואָרעם וועלכער ייִד איז נישט קיין ניצרך? ), וועט איר זיך אַזוי נישט דערפֿרייען, ווי מײַנע קינדער, ווען זיי דערטאַפּן ערגעץ אַ קנעפּל פֿון אַן אַלטער יאַרמלקע, אָדער אַ לידל פֿון אַ ניקאָלײַעווסקע סאָלדאַט. מײַן ייִנגערער זון, גרונם, אַרבעט דאָ הי אויפֿן פּלאַץ. יעדעס מאָל פֿאַלט ער אַרײַן מיט אַן אַנדער גדולה. און יעדעס מאָל איז ער אויסגעשמירט ווי אַ שד. דאָ איז ער געקראָכן אויף אַ בוידעם און געפֿונען אַן אַלט דעקל פֿון אַ שמעקטאַביק־פּושקע, און דאָ איז ער געלעגן אונטער אַ בימה פֿון ערגעץ אַ שול, געפֿונען אַ שיימע פֿון אַן אַלטער תּחינה. איך, אַז איך וועל דערזען אַ שיימע, וועל איך עס אויך נישט לאָזן וואַלגערן זיך אויף דער ערד. איך וועל עס אויפֿהייבן און פֿאַרשטעקן ערגעץ. בײַ זײ איז דאָס אָבער גאָר אַ געהויבענע מיצווה געוואָרן. בײַ זיי גלעט מען עס אויס און מען פּרעסט עס אויס און מען קלעפּט עס אַרײַן אין אַ בוך, און מען שטעלט עס אַרײַן אין אַ שאַפֿע הינטער אַ גלאָז נאַ פּאָקאַז. You ask if my children are involved in business. Who knows? They’re always in a dither, making some kind of deal or other, but what is it that they have to sell? Could it be firewood? Or lumber? Perhaps grain? No, nothing so ordinary. Judging from the word I keep overhearing, they sell something called “folklore.” Have you ever heard of that sort of merchandise? Lately they’ve turned the house into a regular office—an office of “folklore.” My son is the executive director. “The Commercial Firm of Zalmen-Todres & Co.” Ledgers and writing utensils, correspondence and administration. Agents travel around from one Jewish community to another with suitcases and briefcases. Some of them are salaried and some work on commission. Telegrams fly back and forth, letters, printed envelopes, official labels … And wares are bought: antiquated household items, objects old enough to be from King Sobieski’s reign, and other things that belong in a scrap heap, not to mention songs, adages, fables, riddles, a story about a rabbi and his wife … If you were to snag a government contract worth two hundred thousand rubles (and if you were a pauper to boot—but then show me a Jew who isn’t a pauper), I guarantee that you wouldn’t be half as thrilled as my children are when they get their hands on a button from an old yarmulke, or when someone sends them the song of a Jewish soldier from Tsar Nicholas I’s army. My younger son, Groynem, works here on the premises. Every time he comes home he brings a new treasure, and every single time he’s as dirty as a demon. Either he’s climbed up into someone’s attic and found the lid of an old snuffbox, or he’s crawled under a bimah at a synagogue and found a torn-out page from a book of tekhines. If I saw a page from a sacred book, I wouldn’t let it lie on the ground either. I’d pick it up and stick it somewhere. But for them it’s become an act of great sanctity. They smooth the page out and press it flat, paste it into a book and put it behind a pane of glass for exhibition. You should see that exhibition cabinet! A regular stockpile of wares: a broken shofar, a rusty piece of a candlestick, the cover of a Mayver Yabek, 7 7 A religious book containing, among other things, the prayers to be said on one’s deathbed as well as funerary prayers. a kheyder-teacher’s pointer, a children’s flag for Simchas Torah, a prayer shawl fringe that’s no longer ritually valid, willow twigs the worse for wear after the Hoshanah Rabbah celebrations, and other similarly precious items. And each one of them is “registered”—marked down in a ledger, systematically, in order, and according to a sequence … . פֿרעג איך אַ מאָל מײַן זלמן־טודרוסן: זאָג מיר, זאָג איך, צו וואָס קלײַבסטו דאָס דעם גאַנצן האַרמידער מיטן קלאַפּער־געצײַג און שיבֿרי־כּלים? זאָגט ער, דאָס איז אים טײַער, מחמת דאָס איז ייִדישקייט. זאָג איך אים: אַ מאָדנע ייִדישקייט איז בײַ דיר. דײַן שופֿר בלאָזט נישט, דײַן הדס־פּושקע שמעקט נישט, דײַן גראַגער גראַגערט נישט. אַ צעקאַליעטשעטע ייִדישקייט בײַ דיר. זאָגט ער, אַז זײַן ייִדישקייט איז די אמתע ייִדישקייט און פֿאַרקערט: מײַן ייִדישקייט איז אַ צעקאַליעטשעטע. זאָג איך אים: אַ שיין ייִדישקייט איז עס, אַז איבערשרײַבן פֿון צאינה־וראינה, איז רעכט אָן אַ היטל, און לויפֿן הערן דעם רבינס ניגון אין שטיבל פֿאָרט מען אויפֿן טראַמווײַ און דווקא אום שבת. זאָגט ער, אַז דאָס איז אַלץ גאָרנישט. דער עיקר איז דער תּמצית פֿון ייִדישקייט, און דאָס האָט ער, און בײַ מיר איז עס בלויז דער טפֿל. איר פֿאַרשטייט? ער מיט די שיבֿרי־כּלים איז דער גאַנצער ייִד און איך בין דער טפֿל־ייִד. ווער איך שוין ברוגז און זאָג: אַז בײַ מיר איז טאַקע דער טפֿל, פֿונדעסטוועגן וועלן מיר זען, ווער וועט אַ קיום האָבן. ייִדן זענען איבערגעקומען גרעסערע משולחתן, וועלן זיי איבערלעבן דאָס ייִדישקייט אויך! קריגן מיר זיך. דאַכט זיך אין פֿלוג, קינדער זענען געוואָרן ייִדן, הייסע ייִדן, און רעדן עפּעס פֿון ייִדן און ייִדישקייט, און די מחלוקת זענען געבליבן די זעלבע, ווי, נישט הײַנט געדאַכט, אַ מאָל, ווען איך בין געווען דער ייִד און זיי די פּאָליטיצישקע דעמאָקראַטן. נאָר אויף דעמאָקראַטסטווע און ראַבאָטשי וואָפּראָס פֿאַרשטיי איך זיך נישט, אָבער אויף ייִדישקייט פֿאַרשטיי איך זיך שוין אויך נישט? איך פֿרעג אײַך? נאָר איר ווייסט, וואָס איך וועל אײַך זאָגן? עס איז דאָך בעסער, ווי, נישט הײַנט געדאַכט, אַ מאָל, ווען אין דער דאָזיקער שאַפֿע איז געלעגן די טריף־פּסולע סחורה מיט די זאַפּרעשצאָנע ביכלעך, און איך האָב באַדאַרפֿט ציטערן, ווי אַ פֿיש אין וואַסער. הײַנט איז, דאַכט זיך, קיין געפֿאַר נישטאָ, ווי מיינט איר? און אפֿשר? ווער ווייסט? ייִדישיזם, פֿאָלקלאָר, פֿאָלקטילימליכקייט. עפּעס זענען מיר די נעמען נישט גלאַטיק. מען קען זיך נישט טשעפּען, ווי מיינט איר? זאָג איך צו מײַנע קינדער: איך וואָלט וועלן זען אַ מאָל אַ קונה אויף דער דאָזיקער סחורה. עפּעס האַנדלט איר און האַנדלט און קיין קונים זעט מען נישט. ענטפֿערט מען מיר, אַז אַזאַ סחורה פֿאַרקויפֿט מען נישט. מחמת אַזאַ סחורה איז אַ נאַציאָנאַלע רײַכטום, אַן עשירות פֿון אַ פֿאָלק. געפֿעלט אײַך עפּעס אַזאַ מין עשירות?... זאָג איך: איך וואָלט וועלן זײַן אַ בעלן זען, צי קען מען פֿאַר די דאָזיקע עשירות נייען אַ פּאָר שיך – פֿאַלט מען אויף מיר אָן, ווי אויף המנען, אַז עס איז אַ חילול־השם און אַז איך בין קיין ייִד נישט און איך ווייס נישט, ווי צו האַלטן הייליק די ייִדישע טראַדעציע. שאַ! עפּעס אַ נײַ וואָרט!... איר ווייסט ניט, וואָס דאָס איז? נאָר, מילא – טאַרדעציע־שמאַרדעציע, נאָר דער עיקר, טאַטע, גיב געלט! גיב אויף פּאַרטיעס, שקלים, באַוועגעכצן און הײַנט אויף טאַרדעציע. וואָס איז דאָס אַזוינס, איך בעט אײַך? And we fight. Supposedly, the children are Jews now, passionate Jews, and all their talk is about Judaism, yiddishkeit, et cetera. And yet the arguments are more or less the same nasty ones that we used to have when I was the Jew and they were the fancy political democrats. True, I don’t know the first thing about demokratstvo or the rabochii vopros, 8 8 The “labor question.” but now you’re telling me I’m ignorant about yiddishkeit too?! On the other hand, the current fad has one advantage. In the olden days, the cabinet wasn’t full of broken artifacts—it was full of illegal pamphlets and banned books, leaving me to quiver like a fish in water. At least the new craze isn’t dangerous. Or is it? Who knows? Yiddishism, folklore, folkloristicalicity—the jargon sounds a little dubious, if you ask me. It could mean trouble after all—what do you think? So I say to my children, “I’d like to see you find a customer for those wares. You’re always making deals, but there’s nary a customer in sight.” They tell me that this type of merchandise is not for sale—it’s our ethnic patrimony, a national treasure. How do you like that? Some treasure! So I say, “I’d like to see you buy a single pair of shoes with that whole treasure you’ve amassed there.” Then they really let me have it—suddenly I’m the new Haman. Blasphemy! According to them, I’m not a Jew at all—I have no respect for the holiness of the Jewish “tardition.”—Oho, another new word! Any idea what it means? Not that it matters. “Tardition,” shmardition—what it boils down to is, “Daddy, give us money!” Contributions for political parties, shekels for Zionist parties, dues for this, that or the other political movement—and now they need funds for “tardition” too. Please, I beg you, tell me what that word means! אין אַ פּאָר טעג אַרום – אַ פֿרישע טעלעגראַמע, אַ סראָטשנע: "וויסילײַטע נעמעדלענאָ פֿאָנאָגראַף מעכאַניקאָם. נוזשנאָ זאַפּיסאַט באַזעצעניש," ד"ה מען זאָל תּיכּף־ומיד אַרויסשיקן אַ פֿאָנאָגראַף מיט אַ מעכאַניק. מען דאַרף פֿאַרשרײַבן אַ באַזעצעניש. און ווידער אַ מאָל אַ טעלעגראַמע: "וויסילײַטע נעמעדלענאָ פֿאָטאָגראַפֿשציקאַ אַפּאַראַטאָם נוזשנאָ סניאַט רוטשנוּיו קאַדקו לעכעוויצקאָי כאָלאָדנאָי סינאַגאָגי"... אַ ביסל צײַט האָבן מיר זיך דעם מוח געבראָכן. וואָס איז דאָס אַזוינס? נאָר באַלד האָט ער, מײַן זון, זיך אָנגעשטויסן. פֿאָרט אַ פֿאַכמאַן. דאָס איז פּשוט: מען זאָל גלײַך אַרויסשיקן למע"ה אַ פֿאָטאָגראַף מיט דער מאַשין אָפּצופֿאָטאָגראַפֿירן דעם האַנטפֿאַס פֿון לעכעוויצער קאַלטער שול. אַז אַ משולח קומט פֿון דער נסיעה, איז ער אונדזער גאַסט. אַזוי לאַנג, ביז ער ברענגט אין אָרדענונג זײַנע געשעפֿטן, גיט אָפּ דין־וחשבון פֿון זײַן נסיעה, וועגן די אוצרות, וואָס ער האָט געהאַנדלט און די עשירות, וואָס ער האָט געמאַכט. One fine morning, my Zalmen-Todres ambushes me: “Give me a twenty-fiver!” So I ask him, “What do you need a twenty-fiver for?” What kind of a question is that, what does he need a twenty-fiver for? He needs it! Because of a telegram. A very important one from Rozhyshche. What does it say in the telegram? “Go ahead, read it.” So I read it. “Bought carved east, piece of living wood, Hasidic circle, send 25” 9 9 Telegrams generally had to be written in Russian even in cases when it would have made much more sense to write them in Yiddish. The motif of comical misunderstandings due to this fact appears in various places in Yiddish literature (see for example the section “A mayse mit dray shtet” in Sholem Aleichem’s “Fir zaynen mir gezesn”). … You don’t know what that means? Well, you’re not going to figure it out, because that’s not your department. My son, however, immediately translated the Russian for me. Plain and simple: “The emissary from Rozhyshche, who travels around on behalf of our office, the Office of Folklore, in order to buy up all the treasures in the region, would like to announce that he has purchased a marker for the eastern wall of a synagogue, a sliver of wood from an eyts-khayim, i.e., a Torah roller, and a Hasidic circle dance, 10 10 This talk of “purchasing” a dance seems strange, considering the monologue’s other descriptions of the Yiddishists’ approach to collecting folklore. Another possible meaning of “redele” is a matzo-perforator (a wheel with teeth used to perforate matzo dough so that it does not rise when baked); however, it seems there is no specific “Hasidic” type of matzo-perforator. In any case, the interpretation here is not entirely clear. and the entire batch cost a total of twenty-five rubles.” And according to my son, that’s an amazing deal, unheard of, dirt cheap. And a third telegram. “Vysylaite nemedlenno fotografchika apparatom, nuzhno sniat’ ruchnuiu kadku Lekhevichskoi kholodnoi sinagogi” … We scratched our heads over that one for a while. What could it mean? But soon he, my son, figured it out. After all, he’s a professional. It’s simple: “Please, for God’s sake, send a photographer with a camera immediately, to photograph the ritual washstand of the Liakhavichy Cold Synagogue.” 11 11 The central synagogue in various towns and cities was often referred to as the Cold Synagogue, because, being larger, it was difficult or impossible to heat in winter, and was also less frequented, in contrast to the smaller stove-heated prayer- and study-houses, which were often full of men engaged in study, prayer, and discussion, and sometimes even served as nighttime lodgings for students, wayfarers, and the homeless. Whenever an emissary returns from a mission, we provide him with hospitality for however long it takes him to put his affairs in order and report on his journey—the treasures he’s obtained and the riches he’s acquired. Recently, I walked in the door and was greeted by the sight of two unfamiliar people, complete strangers. The first was a stocky fellow with a tousled black beard, hairy hands, and heavy brows, or more accurately, one bushy black eyebrow splayed over both eye sockets like a shaft bow. The second was a young man, tall and thin with a face like a hatchet, such that when you looked at him from the side you saw nothing but cheek, a big flat cheek, and when you looked at him straight on, you saw only the blade of his long sharp nose and a pair of big glasses that he wore pushed back on his forehead. I posed a question to the clan. “Who are the guests?” They answered that the first was a shoemaker from a small shtetl in Poltava Governorate, and the second was an emissary who travels around on behalf of our office—the Office of Folklore. The emissary discovered the shoemaker in the course of his journey through Poltava Governorate and brought him back. And the fellow’s wealthy, they tell me—he’s worth a million! He’s not rich in coin, God forbid, and as far as his physical property, that’s not too impressive at first glance, either—he carries a little bundle containing a fringed undershirt. But his real wealth lies in his bank of knowledge, especially his inner treasury of sayings, proverbs, and axioms. He knows the entire jumbled kiddush for Simchas Torah, 12 12 A festive holiday, Simchas Torah is celebrated with joyful, playful prayer services. One particular custom is the Jahres Kaddish, the use of musical motifs from throughout the yearly cycle of Jewish holidays during the recitation of the kaddish prayer. (Thanks to Cantor Sarah Myerson for this information.) Perhaps this is a reference to a similar custom, or to a tradition similar to that of the “Purim kiddush,” a parodic genre that blends traditional text from the kiddush and other canonic sources with original rhymed Hebrew or Yiddish lines elaborating on the themes of the holiday or celebrating the joys of drinking and carousing (see examples in Noyekh Prilutski’s Zamlbikher far yidishn folklor, filologye un kultur-geshikhte, vol. 2 (Warsaw: Nayer Farlag, 1917), 144-160). two or three Purim-rabbi sermons, 13 13 As part of the “carnival” nature of Purim celebrations, in which power relations are turned on their heads, a “Purim rabbi” was sometimes designated for the holiday—either an erudite scholar who had the ability to marshal the complex mechanisms of textual interpretation ordinarily used in sermon-writing in order to draw out humorous and iconoclastic implications from sacred texts, or an ordinary fellow who took the place of the rabbi to give “sermons” which consisted of jokes, ribald stories, and anything else that subverted homiletic expectations. and almost all of the regional epithets: the Minsk Pigs, the Belz Geese, the Slutsk Fruitcakes, the Tishevits Dancers, the Bobrik Moon, the Yampil Turkeys, the Bobruisk Convicts, and so on. He never forgets which is which—and that’s no small feat, considering that there’s always some violent argument underway around here. The crew splits into two factions—one faction claims that the epithets are properly “the Belz Geese” and “the Yampil Turkeys,” and the other faction swears just the opposite: “the Yampil Geese” and “the Belz Turkeys” … 14 14 This section pokes fun at folklorists who, due to over-enthusiasm and faulty methodological approaches, treated happenstance, idiosyncratic turns of phrase as fixed, widespread linguistic artifacts. Der Tunkeler is most likely relying here on Ber Borochov’s 1913 critique of folklorist Noyekh Prilutski’s extensive collection of toponymous epithets (1912, with an additional installment published in 1917, see the Zamlbikher far yidishn folklor, filologye un kultur-geshikhte, vol. 1 and 2). Thanks to Yitskhok Niborski for pointing me toward this key piece of contextual information; see the discussion of this polemic exchange in Kalman Weiser, Jewish People, Yiddish Nation: Noah Prylucki and the Folkists in Poland (Toronto: University of Toronto Press, 2011), 103-104. Even my daughter thinks this fellow is something special. “He embodies the … . He’s reminiscent of … .” In short, he’s apparently a fascinating creature, a real prize. I examine him from head to toe, but nothing jumps out at me. A shoemaker like any other shoemaker. One thing’s certain: when we sit down at the table, he has no trouble putting away a tidy portion of whatever’s on offer, just like any other red-blooded man. At long last, it’s time for the shoemaker to be on his way. After seeing him off, I return home to find that a new guest has taken his place: a woman wearing boots and carrying a basket. A local specimen this time. Who is she? A market-vendor. My Groynem brought her home from the marketplace. And what’s so special about her? She has a talent for cursing. According to Groynem, she can spew the bitterest insults with unusual flair. “So what?” I ask. “Are you Balak and she Balaam? 15 15 C.f. Numbers, chapters 22-24. And who here deserves to be cursed? ?” No one, he answers, but he needs her for the sake of folklore. He’s collecting Yiddish curses for an anthology. And her curses are the real thing, authentically Jewish, full of folkloristicalicity. Lord Almighty! What on earth is this “folkloristicalicity,” which apparently pops out of anything you poke?! מײַן שבתדיקע זמירות איז בײַ זיי לעילא־ולעילא געוואָרן, מײַן שלש־סעודות פּראַווען מיטן רבינס ניגון איז בײַ זיי אין־לשער, פֿון מײַן הבֿדלה מאַכן מאַכט מען אַ גאַנצן פּאַראַד. מײַן זלמן־טודרוס וויל, איך זאָל ניט אַנדערש הבֿדלה מאַכן נאָר אין זײַנעם אַ פֿאַרזשאַווערטן בעכער פֿון זײַנע שיבֿרי־כּלים... מײַן טאָכטער די קורסיסטקע קריכט אַרויף אויפֿן שטול, זי וויל האַלטן די הבֿדלה־ליכט; און מײַן געראַסים, גרונם מיין איך, שטעלט אָן זײַנע מכשירים: פֿון איין זײַט הודזשעט דער פֿאָנאָגראַף, פֿון דער צווייטער זײַט דרימבלט דער קינעמאַטאָגראַף; פֿון פֿאָרנט שטייט אַ מאָלער פֿון דער קאַדעמיע און מאָלט מיך אויף אַ פּאָרטרעט, און פֿון הינטן שטייט דער קאַפּעל־מײַסטער פֿון קאָנסערוואַטאָריע און פֿאַרשרײַבט אויף נאָטן מײַן הבֿדלה־ניגון... און איך שטיי אַ מבֿולבלער. וואָס האָבן זיי פּלוצלונג דערזען אויף מיר?! 50 יאָר אַז איך מאַך הבֿדלה און קיינער האָט זיך אויף מיר נישט אומגעקוקט, און איצטער איז עס געוואָרן אַ גאַנצער חידוש. עס געפֿעלט זיי די צערעמאָניע, אַ קאַרטינע, אַ פּאַנאָראַמע, אַ טרעאַטער... דער זון שרײַט: זעט נאָר אַ שטערן! די טאָכטער שרײַט: זעט נאָר אַ נאָז! אַ דאַנק גאָט, געפֿונען בײַם טאַטן אַ נאָז! דער מאָלער זאָגט, אַז איך דערמאָן אים אַ ליליען־קאָפּ. איר קענט מיר ניט זאָגן, וואָס איז דאָס פֿאַר אַ פֿיש אַזאַ? בכלל געפֿינען זיי אין מײַן פּנים פּיתום־ורעמסס, און אין מײַן באָרד? אָ, וויי, וואָס אין מײַן באָרד געפֿינט זיך! כאַראַקטעריטשניקייט, מיט געשיכטע, מיט היסטאָריע, מיט סטיל, מיט פּאָעזיע, מיט ביבליע און ווידער אַ מאָל, ווי רופֿט מען עס – פֿאָלקטימלעמליכקייט. So the woman stands there and curses till she’s blue in the face: “May you sit shiva on a summer’s day and suffer from toothache on a winter’s night,” “May your intestines be wound onto a spool and used to measure graves,” 16 16 This is a reference to the custom of “leygn kneytlekh,” measuring graves with thread that will later be cut up for use as wicks in ritual candles. “May your already considerable array of troubles be fruitful and multiply,” and other such curses that I hope no one ever launches at me—may they fall on barren fields and desolate forests. A tongue-lashing of Biblical proportions, may God protect us! Meanwhile, my Groynem laps it all up, beside himself with pleasure, and notes down every curse in his little notebook, with annotations. Each curse gets its own commentary! And then he passes them along to my daughter to type up on the typewriter. Almighty God! May I be granted blessings in proportion to the amount of cash I’ve forked over for that anthology of curses! To listen to them, you’d think I was the eighth wonder of the world when I sing Sabbath hymns these days. They can’t get enough of the Rebbe’s melody for the Third Sabbath Meal. When I make havdallah, they make it into a big production. My Zalmen-Todres isn’t happy unless I make havdallah with the rusty kiddush-cup he’s pulled out of his personal junkyard. My daughter the student gets up on a chair so that she can hold the havdallah-candle. And my Gerasim, I mean Groynem, sets up all his equipment. On one side the phonograph hums, on the other side the cinematograph whirrs. In front of me there’s a painter who’s come from the ’cademy to paint my portrait, and behind me the orchestra director from the conservatory stands and transcribes my havdallah-melody … and I stand in the middle, bewildered. What’s all the fuss?! I’ve made havdallah the same way for fifty years and no one’s ever paid me any mind, but suddenly it’s a major event—a ceremony, a tableau, a panorama, a theeeeee-ter. My son cries, “Just look at his forehead!” Then it’s my daughter’s turn: “What a nose!” Thank God, her father has a nose! The painter says I remind him of a Lilien portrout. Well, as long as he thinks I’m a big fish! 17 17 Ephraim Moses Lilien (1874–1925), a Galician Jewish artist known among other things for his photographic portrait of Theodor Herzl. Here the association is perhaps with his pen-and-ink illustrations portraying Jewish motifs in an Art Nouveau style—see for example Lilien’s illustrations to Berthold Feiwel’s German translation of Morris Rosenfeld’s poetry, Lieder des Ghetto (Berlin: Marquardt: 1902), particularly the portrait of an old Jewish man, 61. Thanks to Natalia Krynicka for this reference. Clearly, my face is full of marvels—not to mention my beard. Don’t get me started on what they see in my beard! Characteristicalness, and narrative, and historicity, and style, and poetry, and Bible, and—naturally—whatchamacallit? Oh yes, folkloristicalicity. מײַן גרונם הערט זיך אַפֿילו יאָ צו צו שידוכים. וויל ער אָבער נאָר אַ ייִדישיסטקע. און די שדכנים ווייסן נישט, וואָס דאָס איז אַזוינס. בײַ זיי אין די ביכלעך איז נאָך דער מין סחורה נישט פֿאַרשריבן. זיי פֿרעגן אַלץ, צו וואָסער פּאַראָדע עס געהערט און וואָס דאָס איז אַזוינס: אַ ברונעטקע, צי אַ בלאָנדינקע? און מײַן טאָכטער, די קורסיסטקע – זי האָט שוין אַ חתן, עפּעס פֿירט זי זיך אַרום מיט אַ בחור – אַ נידעריקער, אַ דיקער, אָן וואָנסן, לאַנגע האָר און אַ גרויסער גדלן. וואָס איז זײַן פּראָפֿעסיע? – ער זינגט לידלעך. פֿאָלקסלידלעך, רופֿט מען עס. דאָס איז זײַן ספּעציאַלנאָסץ. דער עולם לעקט פֿון אים די פֿינגער. אַ גוואַלדיקער מנגן, זאָגט מען אויף אים, לייענט בלאַט, קען גוט נאָטן, קאָן זײַן אַ רעוויזאָר אין אַן אָרקעסטער און אָנפֿירן מיט אַ גאַנצער קאַפּעליע... און איך, איך זאָל נישט זינדיקן מיט די רייד, ווייס נישט וואָס דאָס איז פֿאַר אַ פּרי. אַ חזן ניט אַ חזן, אַן אַקטיאָרשציק נישט קיין אַקטיאָרשציק. וואָלט ער כאָטש זינגען אָפּערעס, אָדער אַזוי עפּעס סעריאָזנע שטיקער מוזיק, צי סטרויען זיך אויף אַ קאָר־חזן. זינגט ער אַלץ אַזעלכע לידלעך, וואָס עס שלאָגט פֿון זיי חלשות! וווּ נאָר אַ שוסטערלידל, צי אַ שנײַדערלידל איז דאָס זײַן געשעפֿט. נאָר אַז אַ שוסטער, צי אַ שנײַדעריונג צי אַ דינסטמיידל זינגט אַזאַ לידל, איז נאָך צו דערלײַדן, אָבער אַז עס שטעלט זיך אַוועק אָט דער בחור פֿון קאָנסערוואַטאָריע אין אַ שוואַרצן פֿראַק מיט די ווײַסע העניטשקעס און שטעלט זיך אַוועק מיט אַ גדלות, פֿאַרוואַרפֿט אַ פֿוס פֿון הינטן און אַ פֿוס אויף פֿאָרנט און פֿאַרלייגט אַ האַנט אויפֿן האַרצן און פֿאַרגלאָצט די אויגן און זינגט אַרויס ווי פֿון אַ טרומייטער: "יעקל מיטן פֿידל, בערל מיטן באַס" אָדער: "האָב איך אַ פּאָר אָקסן, ווי זיי בראָקן לאָקשן," שטיי איך און טראַכט: אָדער איך בין משוגע, אָדער די וועלט איז משוגע. און מײַן טאָכטער העלפֿט אים מיטזינגען. הערסטו, דערפֿון נעמט זיך דאָך די גאַנצע ליבע. ער האָט אויסגעפֿונען, אַז זי האָט אַ גוואַלדיקע שטים, אַ מצה־סאָפּראַן מיט אַ קלאַוואָטור. זינגט זי. אַ גאַנצן טאָג הילכט די שטוב מיט איר געזאַנג. זאָל דאָס זײַן איין רעכט לידל! "פֿייגעלע, פֿייגעלע פּי פּי פּי," "שטייען אַ פּאָר דײַטשן מיט די לאַנגע בײַטשן." ער בעט זיך רחמים: "זע, נחמהלע, עפֿן מיר!" ענטפֿערט זי מיט טרערן ממש: "איך האָב מורא פֿאַר דער מאַמען." אַ חכמה! און נאָך אַזעלכע לידער פֿון אײַנליבעניש און פֿאַרפֿירעניש, פֿון אַ בייזער שוויגער און אַ בייזער וועטשערע... איצט דאַרף זי שוין נישט קיין קורסן, איצט איז שוין קאָנסערוואַטאָריע! נישט צוליב פּראַוואָזשיטעלסטוואָ, חלילה, נאָר פּשוט, כּדי צו קענען זינגען די לידלעך. און אין דער אמתן, ווי קען מען זינגען "פֿייגעלע, פֿייגעלע, פּי, פּי, פּי," אָדער "ציגעלע מיגעלע קאָטינקע," ווען מען האָט נישט קיין דיפּלאָם אויף לכל־הפּחות אַכט קלאַסן קאָנסערוואַטאָריע? My Groynem, on the other hand, is actually willing to listen to the matchmaker. But he only wants a Yiddishist for a bride, and no matchmaker knows what that is—they don’t yet have that sort of merchandise written down in their logbooks. They want to know only one thing: to which breed do Yiddishist girls belong—the brunettes or the blondes? And as for my daughter the student—she already has a fiancé. She’s been going around with a young man—short and fat, no mustache, long hair, and a braggart to boot. What’s his profession? He sings songs. Folk songs, so-called—that’s his specialty. The audience can’t get enough. He’s said to be an incredible musician—he can read music, knows the notes. He could even become a whatchamacallit, an orchestra constructor—get up there in the front and lead the whole bunch. And my daughter sings along. That’s the root of their romance, of course. He “discovered” that she has an incredible voice, a real matzo-soprano with a clavicatura. And since then, she’s been singing. The entire house rings with her voice. If only she’d sing a decent song once in a while! “Little bird, little bird, peep peep peep”; “A couple of Germans stand, with their whips in hand.” He pleads, “See here, Nechama dear, open up!” And she answers with real tears in her eyes, “I’m afraid of what Mama will say.” How clever! And other such songs of infatuation and seduction, cruel mothers-in-law and who knows what else. What does she need university courses for, now that she’s heard of the conservatory? Of course, she’s not in it for the residence permit, God forbid—it’s all for the sake of the myuuuusic. 18 18 Jews who wanted to live outside of the Pale of Settlement (in Kiev, for example) had to obtain a residence permit. One way to do so was to enroll in a recognized educational institution. And indeed, who would dare to sing “Little Bird, Little Bird, Peep Peep Peep” or “Little Goatie-Moatie, Kitty-Cat” without a diploma certifying that you’ve completed at least eight years of conservatory studies? Jews who wanted to live outside of the Pale of Settlement (in Kiev, for example) had to obtain a residence permit. One way to do so was to enroll in a recognized educational institution. The central synagogue in various towns and cities was often referred to as the Cold Synagogue, because, being larger, it was difficult or impossible to heat in winter, and was also less frequented, in contrast to the smaller stove-heated prayer- and study-houses, which were often full of men engaged in study, prayer, and discussion, and sometimes even served as nighttime lodgings for students, wayfarers, and the homeless. Ephraim Moses Lilien (1874–1925), a Galician Jewish artist known among other things for his photographic portrait of Theodor Herzl. Here the association is perhaps with his pen-and-ink illustrations portraying Jewish motifs in an Art Nouveau style—see for example Lilien’s illustrations to Berthold Feiwel’s German translation of Morris Rosenfeld’s poetry, Lieder des Ghetto (Berlin: Marquardt: 1902), particularly the portrait of an old Jewish man, 61. Thanks to Natalia Krynicka for this reference. This is a reference to the custom of “leygn kneytlekh,” measuring graves with thread that will later be cut up for use as wicks in ritual candles. This section pokes fun at folklorists who, due to over-enthusiasm and faulty methodological approaches, treated happenstance, idiosyncratic turns of phrase as fixed, widespread linguistic artifacts. Der Tunkeler is most likely relying here on Ber Borochov’s 1913 critique of folklorist Noyekh Prilutski’s extensive collection of toponymous epithets (1912, with an additional installment published in 1917, see the Zamlbikher far yidishn folklor, filologye un kultur-geshikhte, vol. 1 and 2). Thanks to Yitskhok Niborski for pointing me toward this key piece of contextual information; see the discussion of this polemic exchange in Kalman Weiser, Jewish People, Yiddish Nation: Noah Prylucki and the Folkists in Poland (Toronto: University of Toronto Press, 2011), 103-104. 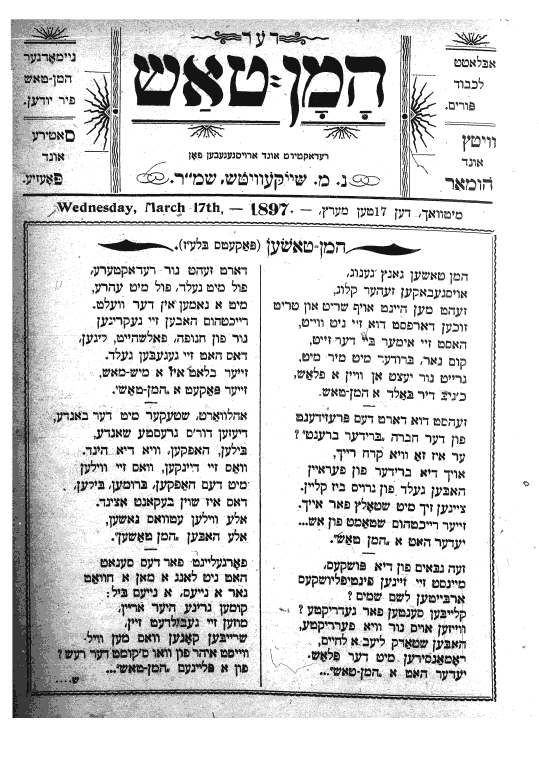 As part of the “carnival” nature of Purim celebrations, in which power relations are turned on their heads, a “Purim rabbi” was sometimes designated for the holiday—either an erudite scholar who had the ability to marshal the complex mechanisms of textual interpretation ordinarily used in sermon-writing in order to draw out humorous and iconoclastic implications from sacred texts, or an ordinary fellow who took the place of the rabbi to give “sermons” which consisted of jokes, ribald stories, and anything else that subverted homiletic expectations. A festive holiday, Simchas Torah is celebrated with joyful, playful prayer services. One particular custom is the Jahres Kaddish, the use of musical motifs from throughout the yearly cycle of Jewish holidays during the recitation of the kaddish prayer. (Thanks to Cantor Sarah Myerson for this information.) Perhaps this is a reference to a similar custom, or to a tradition similar to that of the “Purim kiddush,” a parodic genre that blends traditional text from the kiddush and other canonic sources with original rhymed Hebrew or Yiddish lines elaborating on the themes of the holiday or celebrating the joys of drinking and carousing (see examples in Noyekh Prilutski’s Zamlbikher far yidishn folklor, filologye un kultur-geshikhte, vol. 2 (Warsaw: Nayer Farlag, 1917), 144-160). This talk of “purchasing” a dance seems strange, considering the monologue’s other descriptions of the Yiddishists’ approach to collecting folklore. Another possible meaning of “redele” is a matzo-perforator (a wheel with teeth used to perforate matzo dough so that it does not rise when baked); however, it seems there is no specific “Hasidic” type of matzo-perforator. In any case, the interpretation here is not entirely clear. This monologue was previously translated by Max Rosenfeld under the title “Yiddishists: A Kiev Monologue” (Moment 6, no. 5, May 1981, pp. 54-58). 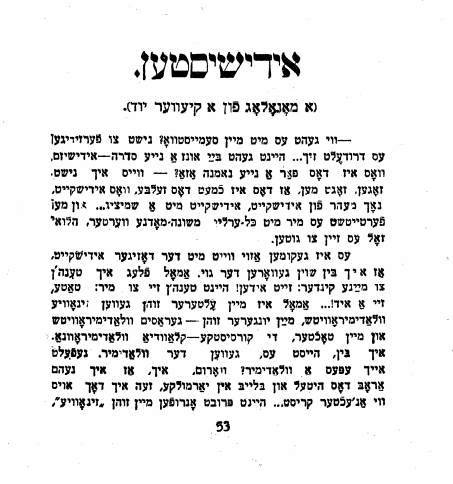 However, the monologue was erroneously attributed to Yiddish writer Zalmen Wendroff, following the attribution of the Yiddish text to Wendroff in the eighty-first volume of the Musterverk series of Yiddish classics (Der emes durkh gelekhter in der yidisher literatur, Shmuel Rozhanski, ed. (Buenos Aires: YIVO, 1980), 66-81). The origin of this earlier misattribution is difficult to ascertain. Rozhanski asserts that the monologue was written in Warsaw in 1911, but does not name the source in which it was first printed. The monologue certainly appeared in the Warsaw daily newspaper Der moment in 1918 under Der Tunkeler’s name (and was subsequently reprinted in his collections Der regnboygn: A zamlung shriftn (Warsaw: Tsentral, 1922?, 59-73) and Oyf tsu kloymersht: Humoreskes (Warsaw: Tsentral, 1924, 53-67). It is almost certain that the monologue was written later than 1911, considering its allusion to Noyekh Prilutski’s collection of toponymic epithets, the first half of which was not published until 1912 (see note 14 below). It is also likely that despite his attribution note, Rozhanski took the text of the monologue from the book Oyf tsu kloymersht, because there is a flaw in the printing of that edition that Rozhanski reproduces in his text (the word translated below as “sequence” which appears in the Moment and Regnboygn printings as “parondek” appears in Oyf tsu kloymersht as “parodnik” with a mostly obscured peh, leading Rozhanski to read, print, and annotate it as the far-fetched “ordenik”). Finally, further evidence that the monologue was indeed written by Der Tunkeler can be found in his humoresque “Vi di provints redt” in the collection Mit di fis aroyf (Warsaw: Ahisefer, 192? ), where he elaborates further on the likelihood of confusing the similar-sounding words oysvorf, forvorf, and oyfruf (translated below as “cast out,” “castigate,” and “agitate”). Telegrams generally had to be written in Russian even in cases when it would have made much more sense to write them in Yiddish. The motif of comical misunderstandings due to this fact appears in various places in Yiddish literature (see for example the section “A mayse mit dray shtet” in Sholem Aleichem’s “Fir zaynen mir gezesn”). A religious book containing, among other things, the prayers to be said on one’s deathbed as well as funerary prayers. For someone like the narrator, whose (probably minimal) education would have taken place within a culture of study in which grammatical analysis even of written Hebrew texts (the Bible, for example) was considered at best newfangled and at worst heretical, an analytical approach to his highly non-standardized vernacular would have seemed the heights of absurdity. Yiddish liturgy written primarily for women, associated with the daily, weekly, and monthly cycles of prayer and household customs, the yearly cycle of Torah readings and holidays, various lifecycle events, and other concerns having to do with family and home. A compendium of Biblical stories, legends, and homilies primarily thought of as being intended for women; one of the bestselling Yiddish books of all time. The oldest still-extant edition (which was the fourth edition at least) was printed in 1622; new editions and versions continue to be published today. It is clear from their surnames that Lapidus and Kalmenson are Jews. This joke is a commentary on the degree of Russification of Jews working in professions which require some amount of formal education and/or integration into the surrounding society, and the higher social status with which that Russification is associated. These particular professions attracted maskilim, proponents of the Jewish Enlightenment, who viewed the Yiddish language with contempt and advocated that Jews integrate into the surrounding society. For more information on the emergence of Yiddish autoethnography, see Barbara Kirshenblatt-Gimblett’s article in the YIVO Encyclopedia: “Folklore, Ethnography, and Anthropology” (2010), http://yivoencyclopedia.org/article.aspx/Folklore_... (accessed December 11, 2018). Der Tunkeler. “Yiddishists.” In geveb, March 2019: Trans. Ri J. Turner. https://ingeveb.org/texts-and-translations/yiddishists. Der Tunkeler. “Yiddishists.” Translated by Ri J. Turner. In geveb (March 2019): Accessed Apr 20, 2019.